The VYNDICATOR is the industries first wireless remote dial indicator providing the craftsman a total measurement system to complete precise measurements in difficult and dangerous to measure locations. The patented technology provides an easy to use platform to quickly measure work pieces where a standard test indicator would not be practical. The VYNDICATOR consists of the transmission unit comprised of the standard stylus and transmitter housing. The transmitter uses Zigbee format to send data packets to the cigarette sized hand held receiver display unit. 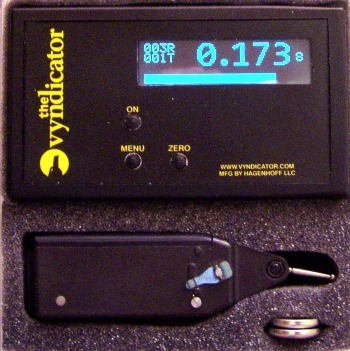 The VYNDICATOR is used and mounted similar to any standard test indicator. Two Industry standard mounting “VEES” are provided. The digital receiver provides remote viewing up to 30 feet when making measurements in difficult locations. Lever switchable stylus direction is provided. Establishment of a zero datum is quickly accomplished by depressing the ZERO button. Numerous VYNDICATORS can be used in the same area where numerous readings must be made simultaneously. The VYNDICATOR digital wire test indicator is used on deep hole boring operations, to replace co-axial indicators, larger vertical boring mills, machine rebuilders, setting strain bars on presses, milling machine centering operations, repeatability tests on machines, quality testing in laboratories. 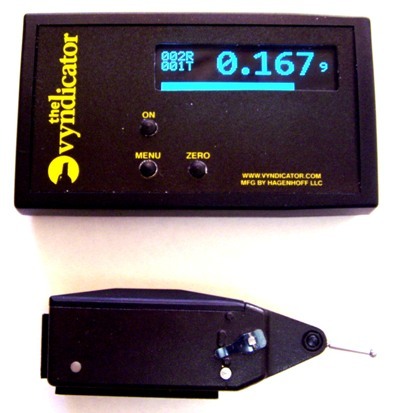 The VYNDICATOR wireless test indicator uses Zigbee format to send data packets at a 40 packet per second rate to the cigarette sized hand held receiver display unit. Zigbee transmission is similar to Bluetooth. Various options are MENU button selectable. The MENU features are: STANDARD MEASUREMENT MODE, TIR MODE, LOW MODE, HIGH MODE, ENGLISH UNITS, METRIC UNITS, ZERO TRANSMITTER BATTERY, ZERO RECEIVER BATTERY, CHOICE of 4 lengths of STYLII, SELECT TRANSMITTER BASE ADDRESS, SET CALIBRATION PROCEEDURE. The standard stylus provides a measurement range of .180 inch (4.57 MM). The 1.47” stylus provides a range of .340” (8.63 MM). The bright OLED display provides a moving bar which tracks the stylus position. In addition, transmission and receiver battery usage is displayed. Automatic shutoff of both receiver and transmitter after 15 minutes is provided. This can be overridden during the turn on sequence of the units. Two AA sized batteries are used by the receiver and two CR2032 batteries are used by the transmitter. 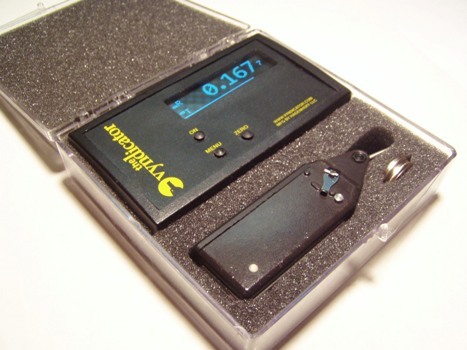 The VYNDICATOR digital dial indicator is warranted by HAGENHOFF LLC for 1 year against defects. Free recalibration is available. Companies That Use The "VYNDICATOR"
Hagenhoff LLC has chosen to use InventSales LLC and DigitalMarketingConnect.com to help them sell their products online! Please let Hagenhoff LLC know that you found their page here on the DMC website.